It appears there is a difference in strategy how to get at wolves, according to the Missoulian. However, I think it is more likely the the Rocky Mountain Elk Foundation (actually David Allen, CEO) has actually given up the fight for wild elk and has thrown in with the worst enemies of elk — catttle and sheep associations.They are probably satisfied with elk shooting pens. 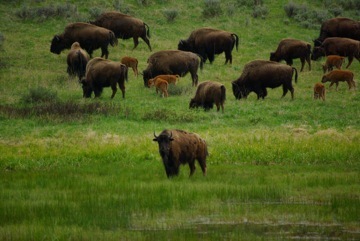 The biggest competitor of elk for food is public range cattle. They eat 90% the same thing, and year after on public grazing allotments at seasons end you find 80, 90, 95% utilization of grass and forbs by cattle and sheep, even though the government grazing plan usually says utilization will be 40, 50 or 60%. In most cases, if you want more elk (and other grazing wildlife), there has to be more food for them. Over hundreds of millions of acres, cows are stealing grass from elk. Look below who has joined the Rocky Mountain Elk Foundation in supporting Senator Orrin Hatch’s anti-wolf bill — almost every livestock association out there, plus a number of right wing hunting groups. Wildlife now dogged by man’s best friend? What is the most widespread predator in most landscapes? Dogs are, and they have important impacts to many wildlife species. From deer and elk to nesting birds to just about any species they interact with, they can be a nuisance, disease carrier, and predator. by Laura Zuckerman – Reuters.